Whether you consider yourself a health nut or not, there is a good chance that you have heard about coconut oil and all the benefits that it can provide. In fact, there might even be a good chance that you are utilizing it on a daily or weekly basis yourself. It has been proven to boost the immune system, help with weight loss, improve cognitive abilities, aid with fungal conditions, and provide anti-inflammatory properties. 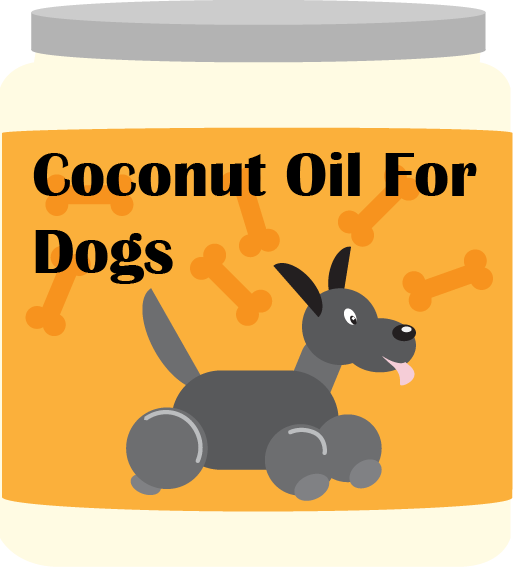 Well, you might be surprised to learn that the popularity of coconut nut oil has grown so widespread that people are now even utilizing it on their dogs. While there are a variety of coconut oil supplements available on the market for your dog, they are not all created the same. So, what really is the best coconut oil for dogs? 1.2 Is Coconut Oil Safe For Dogs? 1.4 Which Coconut Oil Should I Buy For My Dog? 1.5 How Much Coconut Oil Should I Give My Dog? Before you start shopping for coconut oil for dogs, you need to completely understand what coconut oil is and the benefits that it can provide to your beloved pet. Well, when it is all said and done coconut oil really comes from the meat of the coconuts. This section of the coconut is made up of 90 percent saturated fat and since saturated fat is nothing more than Triglycerides (MCTs) there is where all the beneficial properties lie. Now, you are probably thinking that fats and Triglycerides are supposed to be bad. Normally, you would be right, but the triglycerides are also made up of individual fat molecules known as fatty acids. At any given time, coconut oil can contain as much as 64 percent medium fatty acids, which are considered the good fats. How is this possible? The fatty acids in coconut oil are comprised of 48 percent lauric acid, 8 percent caprylic acid, and 7 percent capric acid. It also contains small amounts of myristic and palmitic acids. And, this is really where all the benefits lie. Lauric acid has been proven to provide antibacterial, antiviral, and antifungal properties. The capric and caprylic acids give off similar benefits, but are highly praised for their antifungal properties. The body can also easily absorb these fatty acids and break them down into a useable source of energy, which is where the weight loss properties come into play. These types of fatty acids have also been said to be able to improve athletic ability, but how do they fair against the canine and are they even safe? 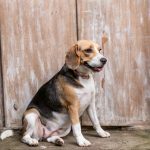 Whether you are looking for coconut oil for dogs skin or you are looking to aid in his digestion, you are probably wondering if these supplements are safe. That really should be any good pet owner’s first concern. 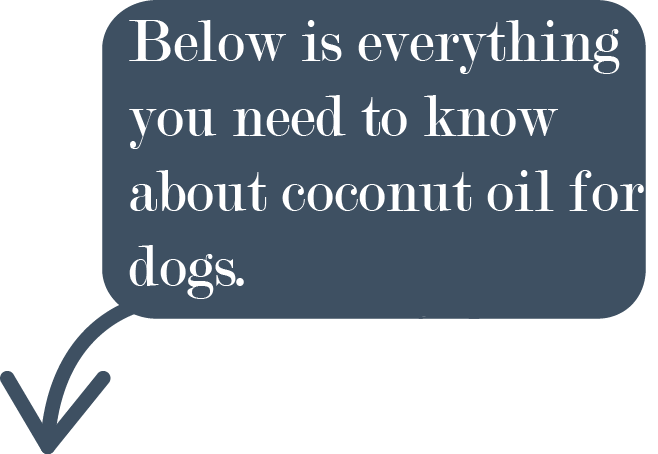 And, it is completely okay to say that coconut oil is 99.9 percent safe for your dog. Not only it is safe for your dog, but also it can provide him or her with a variety of benefits that they won’t get anywhere else. That being said, coconut oil is just like everything else on the market. There is always a risk with anything and that is why it is imperative to adhere to the proper guidelines. Only use the supplements as recommended by the manufacturer and only purchase from a reputable vendor that is willing to back their product. So, what kind of coconut oil is best for my dog and what can it provide your pet? Coconut oil for pets can really have a variety of benefits. In some cases, it can provide skin benefits, digestive aid, increased immune system, a metabolic increase, a more improved musculoskeletal system, as well as aiding in cognitive, eyes, ears, and mouth abilities. Lauric Acid – It really is the lauric acid that provides the anti-inflammatory, antifungal, and antibacterial properties. Lauric acid is even an acid that possess the ability to help fight off unwanted viruses. MCTs – Any vet will tell you that the triglycerides contained within coconut oil can aid in digestion. There might even be some cases where it can correct digestive disorders. Some professionals have even gone as far to say that coconut oil can improve brain energy and mental function in dogs that have grown older. Coughing And Hairballs – Coughing and hairballs is a common problem amongst dogs with allergies. Even dogs without allergies experience the common spell on coughing and hairballs. Well, it has been said that coconut oil can rectify this problem. Skin Conditions – These supplements can aid in a variety of skin conditions like bites, stings, hot spots, itchy skin, dry skin. 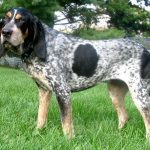 Sleek And Glossy Coats – Everyone wants their pet to have a sleek and glossy coat and this is exactly where coconut oil supplement can help. Eliminating Odors – Dogs can sometimes give off unpleasant odors, regardless of how many times you bathe them. Many individuals have claimed that coconut oil completely solved this problem for them. Metabolic Functions – It has already been established that coconut oil can aid with many metabolic functions like weight loss. It has also said to aid with arthritis and bone health. Which Coconut Oil Should I Buy For My Dog? When you are shopping for coconut oil, you need to be aware of several facts and considerations. First, you need to know that virgin and extra virgin coconut oils are basically the same thing. When you hear virgin coconut oil it basically means that the oil has been unrefined and this is one of the best types of oils available on the market. Unrefined coconut oil is usually shipped or purchased in a glass jar. Of course, you also have refined coconut oils available to you as well, but it is best to avoid these all together. They are often times referred to as RBD oils and it basically means that they contain bleach and have been deodorized. These products are best avoided because they don’t contain the essential nutrients that are found in the organic and unrefined supplements. This is due to the fact that they have been heated and filtered over and over. Just keep in mind that organic coconut oil for dogs works for some pets, while some pets like the taste of refined coconut oil better. When providing your dog with any kind of supplement, it is imperative that you know each dog is different. 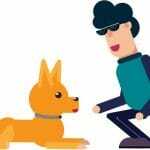 Weight, age and even height can play a role in how much supplement you need to issue to your dog. However, if you are issuing the supplement on a daily basis, it is best to try to work up to one-teaspoon per ten pounds of body weight. So, if your pet weighs twenty pounds, your goal will be to eventually work your pet up to two teaspoons. With that being said, it is best to start with a quarter of this amount and increase the dosage daily as you go until you work your way up to the desired amount. If you are looking to achieve therapeutic or medicinal benefits from the coconut oil it is best to double this dosage. However, once again you want to work your way up to this amount. Don’t just start out with such a large dosage. Still, it is still very important to make sure that your dog is also getting omega-3 oil as well. In fact, most experts would probably recommend rotating omega-3 with coconut oils at different meals. Coconut oil is extremely beneficial, but omega-3 oils still contain other essential nutrients that your dog needs. Feeding coconut oil to your dog really is easy. You can either put it on a spoon alone or you can mix it in with your dog’s favorite food. Each dog is different and has different preferences. It will be up to you to discover what method best suits your pet. To better help you choose the best coconut oil for your dog, below you will find some comprehensive reviews of the best supplements available on the market. Whether you are looking for oil for dogs skin or oil for digestive purposes, these oils will contain the essential nutrients and properties that your pet needs. Zesty Paws Coconut Oil is a 100 percent certified organic product that is made completely with only organically grown coconuts. These growing stages eliminate the uses of harmful pesticides and chemicals, which ensure that your dog gets an unfiltered and safe product. Zesty Paws Coconut Oil can provide your pet with a variety of benefits. The neat thing about Zesty Paws Coconut Oil is that it can easily and quickly be applied to the coat of your dog. When applied in a topical manner, this oil can relieve itching, aid in fleabites and itching, remove red spots, and eliminate irritation caused by hot spots. It has also been proven to aid with dry skin and dandruff. Unfortunately, these are conditions that dogs normally face, but simply rubbing this supplement on your dog’s skin can provide him or her with the results and relieve that you desire. Every dog deserves a good healthy coat. This not only represents a well-maintained dog, but it represents a good pet owner as well. Unfortunately, dog’s coats can grow dull over time and this is where Zesty Paws Coconut Oil can come in handy. This oil contains the properties that can make your dog’s coat shine like new again. It can also eliminate that matted and brittle hair. 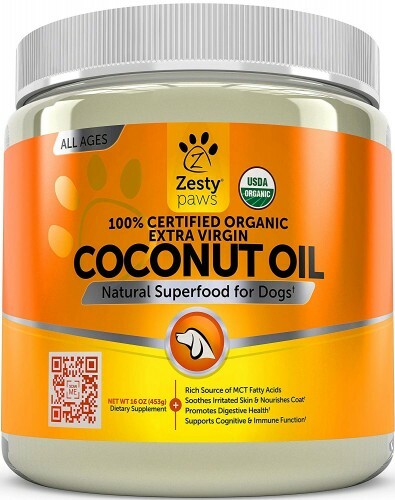 If you are looking for a more organic way to treat your pet’s skin, cognitive, or digestive conditions, look no further than Zesty Paws Coconut Oil. 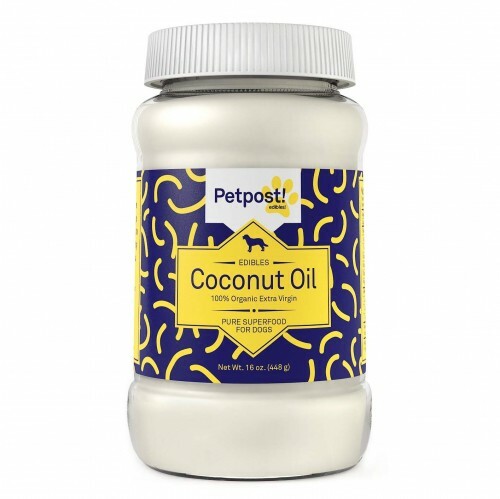 Petpost Coconut Oil For Dogs is packed with tons of saturated fats, vitamin E, vitamin K, MTCs, and lauric acid that can be extremely beneficial to your dog. When you really sit down and look at everything that Petpost can offer, it really is easy to see why more and more vets and groomers are recommending this product to their patients. With its ability to aid in dry skin and itchy hot spots, you are truly looking at one great supplement that is going to give your pet a better quality of life. The creators of Petpost really care about their product and their customers. They only want to provide you with the very best of the best. And, that is why they go into the field and hand pick each one of their coconuts. They only use organically grown coconuts that are hand-picked by the highly skilled research team to ensure that you get the very best and safest alternative. At the end of the day, the most impressive thing about Petpost is that it comes with a money back guarantee. This means that at any point if you have any problems or qualms with this product, you can contact the manufacturer and they will completely refund your money. When you combine their warranty with the company’s excellent customer service, you are truly looking at one company that really cares about their product and customers. With a money back guarantee, you and your pet basically get to try Petpost before you fully invest. It will be easy for you to see why the company is willing to offer this type of guarantee. 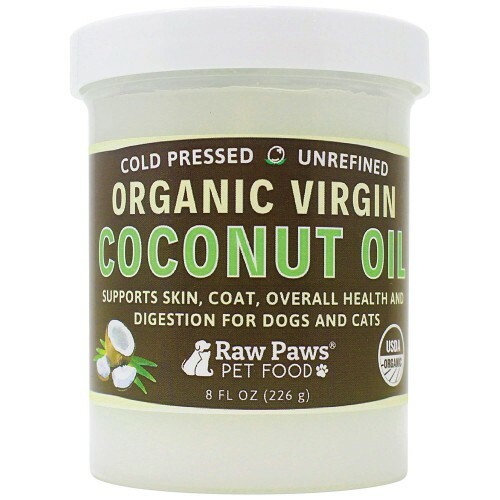 If you are looking for one of the most beneficial and tasty organic coconut oils available on the market, look no further than Raw Paws Organic Coconut Oil. This oil contains the ultimate properties that will not only aid in a variety of skin conditions, but it will actually help battle fleas and ticks. It might not have the power to kill off these troublesome insects, but it possesses the power to control them and relieve itching, which might be just the thing your pet needs. When it comes to applying Raw Paws Organic Coconut Oil, you will not find a supplement that is easier to apply. There are a variety of ways that you can apply this supplement to your pet. You can simply put some on his nose, rub it on his skin, put it on treats, mix it with his favorite food, or you can just feed it to him right off of the spoon. If you are familiar with most coconut oils on the market, you probably know that they don’t have the best taste and usually have to be force-fed. That will not be the case with Raw Paws Organic Coconut Oil. 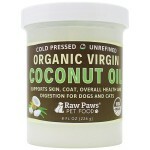 Raw Paws Organic Coconut Oil tastes so good that your dog will eat it willingly right off the spoon. It really doesn’t get easier than that. When it comes to quality ingredients you will not find another company that offers the highest quality in their ingredients. 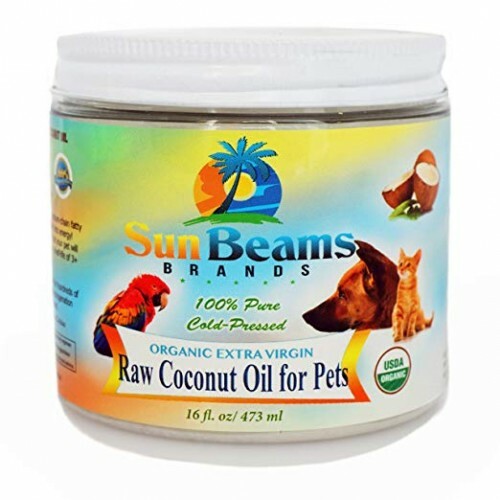 In fact, the manufacturer of Raw Paws Organic Coconut Oil has gone as far to make sure that organic products, including their coconuts are USDA approved. This ensures that your pet only gets the best with every dosage. With USDA certified materials and a money back guarantee, what’s not to love about Raw Paws Organic Coconut Oil? 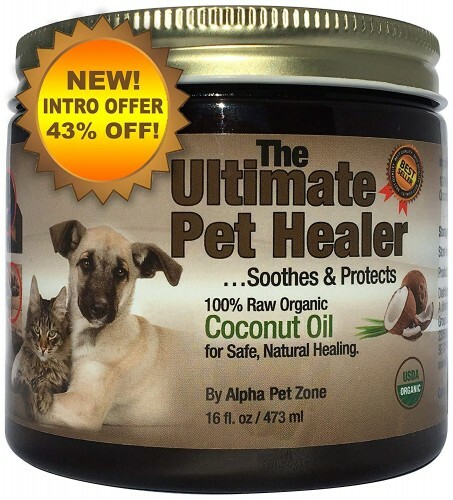 Alpha Pet Zone Coconut Oil is a virgin coconut oil that is extremely easy to apply and comes packed with tons of benefits. It not only aids in dandruff, but it can reduce itching and irritation in a variety of skin conditions. When you take advantage of this amazing product, there will be no more need to dander remover spray again. Every dog deserves a shiny coat, but after time and growth this is something that just tends to wane. However, Alpha Pet Zone Coconut Oil can provide your dog’s skin with the nutrients that it needs to bring it back to life. Whether you are looking to eliminate unwanted itching in your pet, aid in allergy itching, or you want to make his coat shine, Alpha Pet Zone Coconut Oil should be your go-to solution. 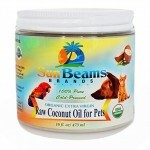 Sun Beams Brands Coconut Oil is a 100 percent premium virgin certified cold-press coconut oil. It is only comprised of the highest quality ingredients to ensure that your pet only gets the best of the best every use. The antifungal, antibacterial, and anti-inflammatory properties can come in handy in a variety of situations. 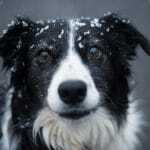 Dandruff is a common condition that dogs face and it really leaves a mess everywhere. Eventually it gets so bad that it makes your pet’s hair fall out. All of this can be completely avoided with the assistance of Sun Beams Brands Coconut Oil. The extra salmon and omega oils really make this product stand out amongst the competition. This eliminates the need to alternate and purchase additional oils.